If you want to get the latest news about Kellogg Community College events and deadlines, see fun photos from campus or participate in the occasional contest, all you have to do is like KCC’s official Facebook page, right? A lot of people don’t realize it, but just because you like an organization’s page on Facebook doesn’t mean you’ll see the things they post. In fact, you can like a page on Facebook and never see anything they post, based on the algorithms Facebook uses to deliver content to users. The numbers vary depending on the source, but content posted to Facebook pages run by businesses and other organizations can be shown to as little as less than 10 percent of the people who like that page on Facebook. Visit KCC on Facebook at www.facebook.com/KelloggCommunityCollege and check out our page. If you like what you see, click the “Like” button at the top of the page to like KCC on Facebook, if you don’t already. Click the down-arrow icon at the very top of the page, and in the drop-down menu click “News Feed Preferences.” It’s located near the bottom of the drop-down list. 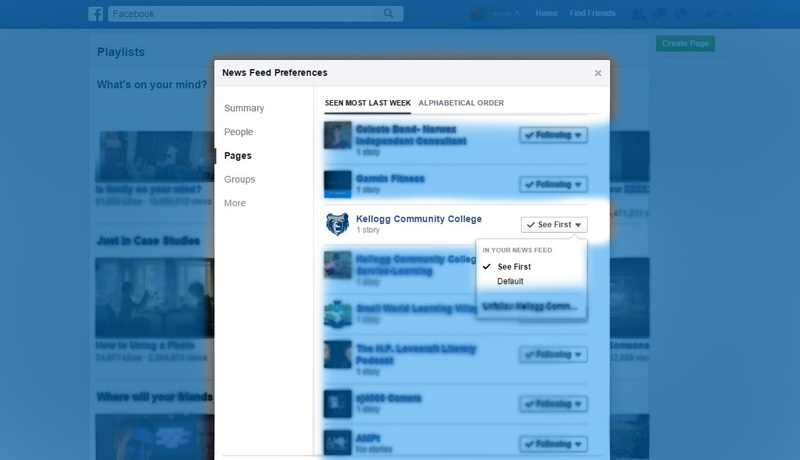 In the “News Feed Preferences” box, click “Pages” in the left-hand menu, find Kellogg Community College’s page on the list, and hover your mouse arrow over the box that says “Following” to the right of the listing. That’s it! After completing these steps, you should see more posts from KCC on Facebook. Feel free to message us and let us know what content you like best or would like to see more of. If you have comments or questions about KCC’s Facebook page or other social media platforms, contact Simon Thalmann, digital marketer/writer at KCC, at thalmanns@kellogg.edu.